Self. The archetype of wholeness and the regulating center of the psyche; a transpersonal power that transcends the ego. Like any archetype, the essential nature of the self is unknowable, but its manifestations are the content of myth and legend. The realization of the self as an autonomous psychic factor is often stimulated by the irruption of unconscious contents over which the ego has no control. This can result in neurosis and a subsequent renewal of the personality, or in an inflated identification with the greater power. Experiences of the self possess a numinosity characteristic of religious revelations. 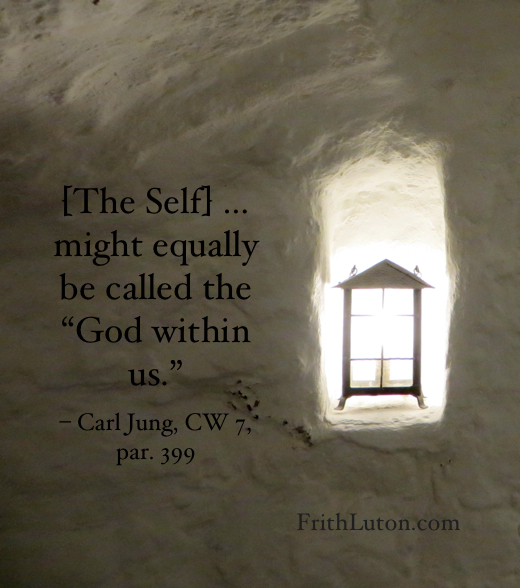 Hence Jung believed there was no essential difference between the self as an experiential, psychological reality and the traditional concept of a supreme deity.